"George arranged a wonderful week in the Peloponnesus! So historic and such beautiful..."
"Absolutely loved the landscapes, continuously having the sea in our sight. The food..."
"It was an experience of a lifetime!!!! We got to visit places that we would not have..."
"A good way to explore the Mani. We enjoyed biking in our own pace and always have..."
"A most enjoyable holiday. The bikes were really good, & the coastal scenery wonderful...."
"Our two guides were amazing. Niovi and Dimitris took the group out each night for..."
"I couldn't be more satisfied with this amazing tour! Everything was very well organised..."
Discover Peloponnese in 7 days from Athens: Mycenae, Sparta, Monemvasia, Epidaurus. 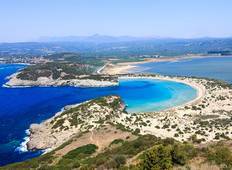 "We did the Paradisial Peloponnese tour. It is an amazing tour full of variety. The..."
"After many years around Greece and the Greek Islands, that for me is the ultimate..."
"Tour was amazing , beautiful, well planned"